GUARANTEED ONE-ON-ONE MEETINGS WITH PE DECISION MAKERS! As an executive who has developed or is in the process of developing an investment thesis(a unique idea or angle based upon your industry experience) you will have interacted with an average of 100-200(and in some cases as many as 600) PE firms before finding one that reciprocates your interest. You may be thinking to yourself, “OK, no problem. I’ll just do a quick search, throw together a list of contacts and blast an outline of my thesis out to 100-200 firms. Surely one of these will respond!” Unfortunately, this just simply isn’t reality in the private equity world. Throughout the course of a single year, the typical private equity firm will receive an average of 2,999 unsolicited executive resumes. Since a typical firm has approximately fifteen employees and only closes an average of two deals per year, time is a commodity few are able to utilize. In other words, you will rarely, if ever, receive a response let alone secure an introductory phone meeting. 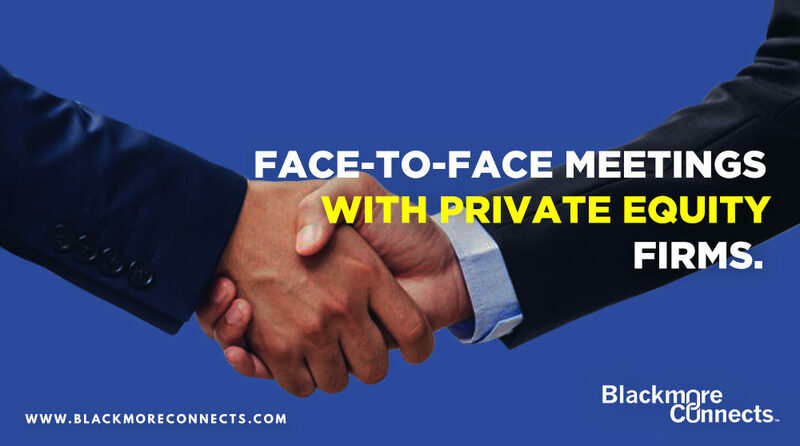 As an executive member within BlackmoreConnects™ – The Association for Private Equity, your expertise and industry experience will be leveraged, through participation in our ‘Backable Exec’ process, databases and outreach tools into the qualified candidates with whom private equity firms desperately want to connect. A stellar resume is not an angle in and of itself. Private Equity already knows that you’re a fully capable executive with a track record of success — this is a given. A resume will, however, be noticed based upon a unique angle or idea(investment thesis). This is exactly why each of our new members are immediately assigned to one of our deal partners who support them in the development and refinement of an investment thesis. Private Equity wants to get to know you on a personal level, your character, as equally as they want to understand your unique angle. which is why we maintain the bandwidth to do what 99% of lower-middle market firms cannot: the time-intensive and exhaustive due diligence necessary to identify the most relevant, desirable and qualified executive leads who have actionable investment theses and assemble them into an environment where they have the opportunity to meet face-to-face with Private Equity representatives. This event is the only choice when it comes to Executive-Private Equity networking when the objective is to secure a role within a Private Equity-owned company or funding for an investment idea. No one makes connecting easier, more efficient, and rewarding. The ROI to participate in this event will save you tens of thousands of dollars and hundreds of man-hours! Registration officially opens twelve weeks prior to each event, however, you may register for any conference at any time. Bronze members receive a 35% discount on all events, BronzePlus+ members receive their first conference for FREE(35% discount on all events after this) and Gold members enjoy access to six events for FREE! BlackmoreConnects™ conferences provide you with education and knowledge on how best to monetize your background and secure a role within the Private Equity space. You will learn essential information, news, strategies, and skills from top executives, jump-starting your career in Private Equity and placing you at a distinct advantage in landing a Private Equity role. Before, during and after the conferences, you will have the opportunity to network with these top private equity executives face-to-face. This opportunity will allow you to market yourself to firms who could potentially be looking for executives and are ALWAYS looking for actionable deals. Building your network and making these connections is key in setting yourself apart from the thousands of your executive peers trying to get into the Private Equity game. – A complete pre-conference ‘Roadmap to Success’ including a complete list of event attendees(private equity reps and executives) including names, phone #, email address, profile page, investment criteria, portfolio page, etc. – Upon registration, you are assigned to one of our deal partners who immediately begin working with you to develop an investment thesis.